A woman has filed a talcum powder lawsuit against Johnson & Johnson, alleging the pharmaceutical giant failed to warn women about the potential risks associated with using their products containing talc. The plaintiff claims she used the products regularly for many years, leading to a diagnosis of ovarian cancer in 2005 when she was just 24 years old. The recent lawsuit was filed in Pennsylvania District Court on August 24 by Dolorae Handy. Handy states that she used Johnson & Johnson talc products for feminine hygiene for most of her life. Use was based on the company’s marketing of the products, which has associated talc products with “freshness, cleanliness and purity,” according to Handy’s complaint. The company did not indicate there was a possible risk of ovarian cancer associated with their product, although studies dating all the way back to 1971 indicated otherwise. Handy states that her 2005 diagnosis of ovarian cancer resulted in “severe and permanent pain, suffering, disability, impairment, and loss of enjoyment of life.” She has undergone surgery and treatments for her cancer, which resulted in significant medical bills and other expenses. She will also have to live with the fear of her cancer returning at some point in the future. Handy outlines numerous studies that point to a heightened risk of ovarian cancer when Johnson & Johnson talc products are used regularly in the perineal area. The first, conducted in Wales in 1971 by Dr. WJ Henderson, found an association between talc and an increased incidence of ovarian cancer. That study was followed by the first epidemiological study in 1982, which found women that used talc products had a 92-percent increased risk of ovarian cancer. The head researcher in this study, Dr. Daniel Cramer, advised Johnson & Johnson to place a warning label on their talc products at that time. The company did not follow Dr. Cramer’s advice. 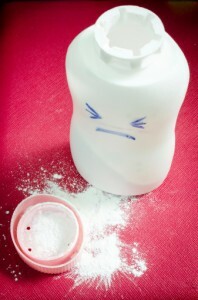 Since then, an additional 22 studies have shown a link between talc and ovarian cancer. In 1993, the United States National Toxicology Program published a study that found talc to be a carcinogen. In 2006, the International Association for the Research of Cancer (IARC), part of the World Health Organization, classified talc as a “Group 2B” human carcinogen. That same year, the Canadian government also classified talc as “D2A,” meaning it is very toxic and cancer-causing. Canada has the same classification for asbestos, a widely known carcinogen. Despite the mounting evidence that use of talc for feminine hygiene may be dangerous, Johnson & Johnson has continued to state their product is safe for regular use. Women like Handy are now filing lawsuits against the company, claiming those assertions are simply untrue. There are currently several thousand lawsuits pending in courts across the country. Two of those cases have already gone to trial, resulting in multi-million dollar awards for the plaintiffs. In her lawsuit, Handy is demanding general, exemplary and punitive damages from Johnson & Johnson, for mental anguish, pain and suffering, medical bills, lost wages, physical impairment and disfigurement, and loss of enjoyment of life.